This vintage style apron is easy to make and cheap on the budget. 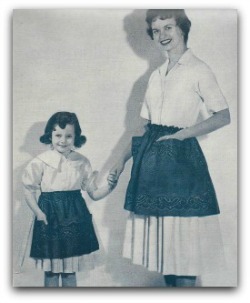 Easy vintage style apron that makes up quickly and every mother and daughter will love. These are easy enough for the beginner to sew but they don't look it. Fun gifts to make in a jiffy. Mothers apron needs three 22" bandannas and 2 yards of 1" grossgrain ribbon. 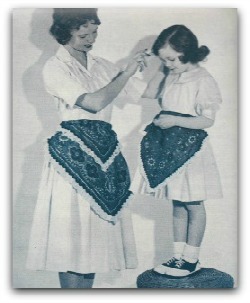 Mother's apron: Sew two bandannas together. Fold top edge back 2" hem. Make second row stitching 1/2" from top. Cut two 10" square pockets from third bandanna. Sew in center of each. Run ribbon through top hem. Turn bottom bandanna edge up 7 1/2" to right side; stitch through center, at edges, in between for pockets. Fold back 1 1/2" at top edge; hem. Make second seam 1/4" from top. Matching Hoop Aprons: Need 22" bandanna, 2 yards rickrack, apron hoop for large apron; 17" bandanna, 1 3/4 yards 1" ruffling, 1 3/4 yards rickrack, small hoop for little apron. Fold over one corner of bandanna so point is 9" from fold on large apron, 8" on small apron. Press. Open ; top-stitch ruffle on triangle, stopping at crease. Turn over scarf ; top-stitch ruffling along remaining edges. Sew rickrack to cover heading or ruffling. Fold flap over on press line. Run row of stitching 1" below fold for casing.